New Delhi: In a one of its kind development, a hospital owned by Union Environment Minister, Dr Mahesh Sharma, has received a notice from the National Green Tribunal seeking its response on alleged violations of Environment laws of the country. “The green belt in question has been encroached upon by respondent number 6 (Kailash Healthcare Ltd) for the construction of a private hospital. The satellite image of the location clearly shows trees at the spot prior to their removal,” the petition stated. “This act of construction on the green belt is in violation of the Environment (Protection) Act, 1986, the National Forest Policy and various directions of this hon’ble tribunal,” the petition added. Acknowledging a petition by environmental activist Vikrant Tongad, the green court issued notice to Kailash Healthcare Ltd, along with the Uttar Pradesh government, Forest Department, Horticulture Department, and Noida authorities.The tribunal will hear the matter on November 27. 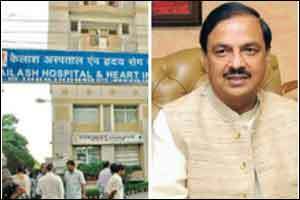 Kailash Healthcare Ltd is owned by Dr Mahesh Sharma, who is a member of Parliament from Gautam Budh Nagar, of which Noida forms a part. Sharma is Minister of State for Environment, Forest, and Climate Change as well as Minister of State (Independent Charge) for Culture.